8 1/4 x 11 1/4, manuscript in ink, with the original 1863 imprinted transmittal cover. Invoice of Subsistence Stores turned over at Boston, on board bark "P.R. Hazeltine" to Capt. W.W. McKim, A.Q.M., U.S.A., by Capt. E.D. Brigham, C.S., U.S.A., for transportation and delivery to Capt. A.J. McCoy, C.S. Vols.,, Department of the Gulf, New Orleans, Louisiana. 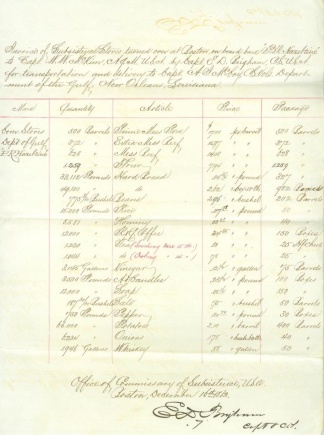 Itemized account of the stores shipped via boat include prime mess pork, mess beef, flour, hard bread, beans, rice, hominy, coffee, tea, vinegar, candles, soap, salt, pepper, potatoes, onions and whiskey. Office of Commissary of Subsistence, U.S.A., Boston, December 16th, 1863, E.D. Brigham, Capt. & C.S. Light age toning and wear. Very fine. Also comes with the original 9 1/2 x 4 1/8, imprinted envelope from the Treasury Department, with ink notations on it as follows: No. 44. Invoice and Receipt. Barque "P.R. Hazeltine." From Boston, Mass., to New Orleans, La. Cargo- C. Stores. Dec. 17, 1863. Very fine. The officer who signed this invoice, Captain Elijah D. Brigham, was from Massachusetts. He was commissioned captain C.S. Vols., Sept. 30, 1861; 2nd lieutenant, 10th U.S. Infantry, Nov. 28, 1862; 1st lieutenant, Nov. 4, 1863; captain, C.S. Vols., Feb. 9, 1863; brevet major and lieutenant colonel, March 13, 1865.